Two full calendar months has gone, since the leader of Indigenous People of Biafra, Mazi Nnamdi Kanu got missing. It is 60 days, since the leader of IPOB was lastly heard from, following the bloody raid and onslaught of Biafrans in his residence and at Afara Ukwu Ibeku Umuahia, Abia state. In a severe and fierce attack carried out by Nigerian army, under the command of former military General, Muhammadu Buhari, and the watchful supervision of General Turkur Buratai, the Nigerian chief of army staff, in the home of Mazi Nnamdi Kanu, not less than 28 Biafra activists were gruesomely killed and scores wounded. However, after this atrocious incident, nobody has ever seen nor heard from Mazi Nnamdi Kanu. It is under public awareness that the trigger-happy Nigerian military on the eve of Thursday 14th September, 2017, illegally and unlawfully abducted Mazi Nnamdi Kanu and his parents to an unknown destination, and ever since then, their safety and whereabouts has been shielded by Nigerian army from his family members and the entire Biafran populace. Mazi Nnamdi Kanu's home was invaded by Nigerian military, without any legal permit or approval from the Nigeria Senate. In accordance with this, it is clearly substantiated that Nigerian military's purpose of raiding Mazi Nnamdi Kanu's home was to assassinate him, which must have possibly accomplished, as no one has ever seen or heard from Mazi Nnamdi Kanu after the brutal and barbaric incident. Meanwhile, Nigerian military denied of either invading his home or abducting Mazi Nnamdi Kanu and his parents, but the truth remains that Nnamdi Kanu is in their custody as there are uncountable and undeniable evidences which proves that Mazi Nnamdi Kanu is actually in the army's custody. There are uncountable videos and pictures evidence showing heavy and sporadic shooting at Mazi Nnamdi Kanu's home by Nigerian army, on the day they invaded his home and whisked him and his parents away. Lots of investigations that was carried out by both International and national bodies, especially media houses proves factually that Mazi Nnamdi Kanu is indisputably under the custody of Nigerian army. The videos made during investigation by Naij.com news, a Nigerian independent media outfit and Dutch Welch (DW) media outfit amongst others are still another evidence that the leader of IPOB is in Nigerian military detention facility. Nigerian army must produce Mazi Nnamdi Kanu, the leader of Indigenous People of Biafra, Director of Radio Biafra London and Biafra Television, dead or alive. 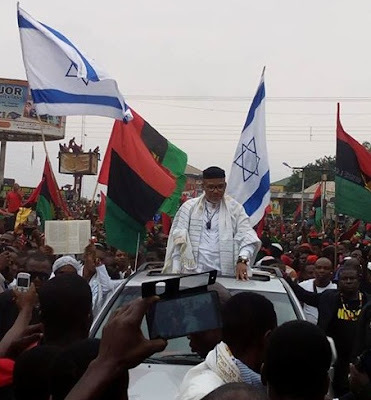 Notwithstanding, several attempts made by Biafrans to see their leader, Mazi Nnamdi Kanu have proven abortive, as Nigerian military keeps denying that IPOB leader is in their custody. Biafrans anticipated to see Mazi Nnamdi Kanu in his past court sitting and hearing of his case between Nigerian government on 17 of October 2017, but was denied the opportunity, as Nigerian army deliberately refused to bring him to court in a bid to substantiate their claim of not having him in their custody. Nevertheless, Biafrans demands that Mazi Nnamdi Kanu be produced on 20th November, the day of next court sitting and hearing of his case. Although IPOB has always been peaceful from the first day of its emergence, and even in the face of heavy state sponsored attacks on Biafrans, such is likely to change if the Nigeria government and their military fails to produce Nnamdi Kanu alive. IPOB will soon pull all resistance, as the attacks can no longer be tolerated. Biafrans has consistently warned the Nigeria government and their military that, if any harm befell Nnamdi Kanu in their custody, the consequences shall be very devastating, as what will befall Nigeria will be horrible. Nigerian military must unfailingly produce the leader of IPOB come 20th of November 2017 for a continuation of his court trial.